/ Modified dec 19, 2016 5:09 p.m. Annual survey will be held on Jan. 25, in Tucson and across the US. 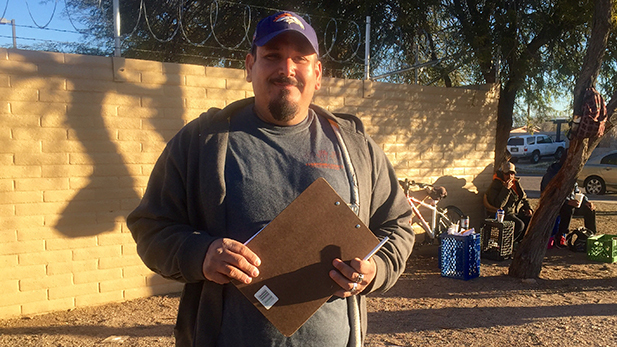 Al Pesqueira led a team of volunteers to count homeless people in South Tucson. "The homeless see that they do count, that they matter to these volunteers and to the different agencies in Pima County," he said. A nationwide count of the homeless will take place on Jan. 25, and officials in Tucson are looking for volunteers to lend a hand. Teams of volunteers will head out to interview the homeless, asking a range of questions, including where they slept the night before. Settle Madden, who works with the Tucson Pima Collaboration to End Homelessness, said volunteers can help out in a number of ways - from interviewing to working on logistics, like making sure that teams have enough interview forms. "Generally, people are glad to have regular folks acknowledge that they exist and that they have needs and that such people are interested in finding out about their needs so that we as a community can fill them," said Madden. Her group is also looking for donations of $5 gift cards that they hand out to homeless people who participate in the count. The cards are usually for fast food restaurants like McDonalds or Subway, but Madden said all will be accepted. Click here for more information on how to volunteer.